The Mortal Kombat 9 Finalizations Gamepack for Titan One features all Characters and Stage finalizations. The finalization can be a Fatality, Babality or Stage Fatality, and it's a special finishing move that can be used against one's opponent at the end of the final match. When the announcer says "Finish Him" or "Finish Her" the player can choose to kill him or her through a finalization move. A finalization requires certain distances and quick button sequences in order to achieve the desired result. For example, one of Sub-Zero's Fatalities requires that he stands close to the opponent and quickly execute Back, Forward, Down, Forward, Kick. Every character has their own special Fatality that must be performed at a certain distance from the opponent, if input correctly, the background will darken, followed by the desired result. 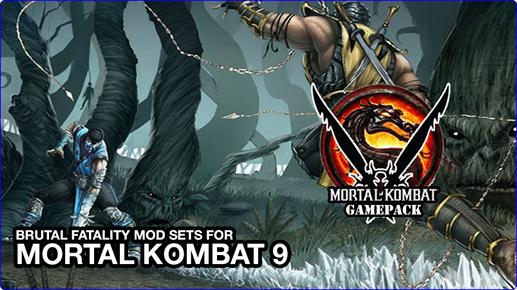 The Mortal Kombat 9 Finalizations Gamepack simplifies and standardizes the way each finalization is started by just a combinations of 2 buttons pressing. For any character chosen by the player, the Gamepack will know the exactly distance and sequence must be executed to perform the desired finalization. Player LED 1: No character is selected, controller in regular mode. Player LED 4: There is a character selected. To check the character number, enter into menu mode. 1. Win the fight and wait for "FINISH HIM/HER". Not applicable to all stages, a red skull emblem indicates which stage have fatality. Dualshock 3: If LED 4 blinks 2 times and LED 3 blinks 7 times, the selected character is 27 (Mileena). XBox 360 Controller: If LED 3 blinks 1 time and LED 4 blinks 5 times, the selected character is 15 (Quan Chi). To save the current character selection into shortcut 3. LED 3 will blink 3 times. To save the current character selection into shortcut 4. LED 4 will blink 3 times.